The purpose of this guideline is to increase all nurses’ & multidisciplinary team’s confidence, knowledge, skills and abilities in the identification of adults within health care facilities at risk of falling and to define interventions for the prevention of falling. It does not include interventions for prevention of falls and fall injuries in older adults living in community settings. Specifically, the Prevention of Falls and Fall Injuries in the Older Adult guideline will assist nurses to: Identify risk factors for falls; Decrease the incidence of falls; and Decrease the incidence of injurious falls. 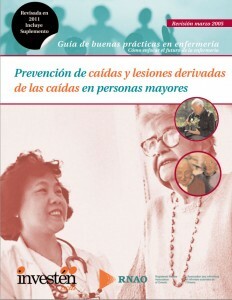 The guideline focuses on: Practice Recommendations for assisting practitioner and client decisions; Education Recommendations for supporting the skills required for nurses; and Organization and Policy Recommendations addressing the importance of a supportive practice environment as an enabling factor for providing high quality nursing care which includes ongoing evaluation of guideline implementation. The guideline can be found here. 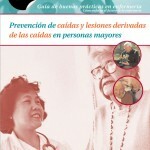 Guía de buenas prácticas: Prevención de caídas y lesiones derivadas de las personas mayores (Registered Nurses’ Association of Ontario 2011, Spanish) Reviewed byArnhild Jenssen Nygård on February 29 .